MamaBreak: Gift Baskets Plus Coupon Code!!!! Looking for the perfect gift for someone that is impossible to buy for? Looking for an elegant gift that will make someone's day? 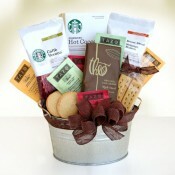 I love gift baskets because they are such a wonderful gift! You can make them personal for those you know very well, or can just include fabulous items for people that you may not know as well! Gift Baskets Plus has been providing gift baskets for over 10 years! Right now, if you use the code 15OFF, you can save 15% off of your purchase! Just click here: http://www.giftbasketsplus.com/ and check those items off of your "to buy" list! Everyone love gifts and surprises and if its come in a Gift Baskets then its awesome because basket contain different type of gift. I love gift basket to give loved one.